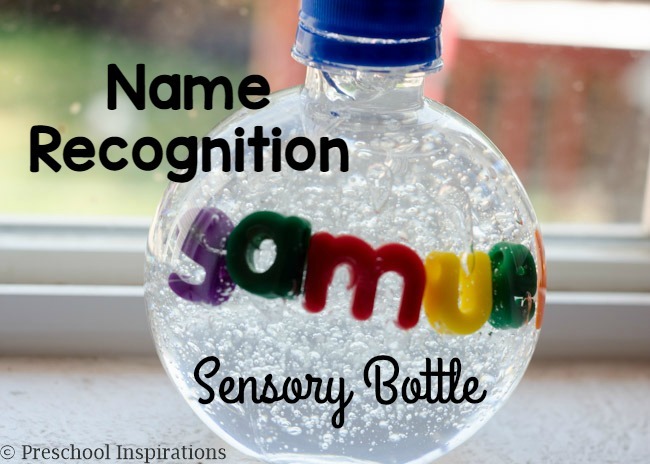 Teach children to spell their names or to work on name recognition with this 2 ingredient personalized name sensory bottle! Name recognition and spelling should be fun and easy! Children are already excited about learning their names, so they just need a visual to help along with the process. Whenever parents or other teachers ask me for name activity ideas, hands-on methods are my favorite! And sweet Samuel thought this sensory bottle was amazing! This discovery bottle is a part of my Discovery Bottles Blog Hop, so there are some more fantastic bottles below! Here are all of the materials you will need to make this sensory bottle! I get my hair gel at the dollar store! There’s no need to get anything fancy. When you add the hair gel, it is utterly impossible to get the last bit of hair gel out of the bottle…unless you are really committed and have a lot of time. I lose patience easily with these sorts of things though, so I always plan to have more than I need. Alphabet beads are an object we have around all the time! I buy mine online, and we have an uppercase alphabet bead set and lowercase alphabet beads. 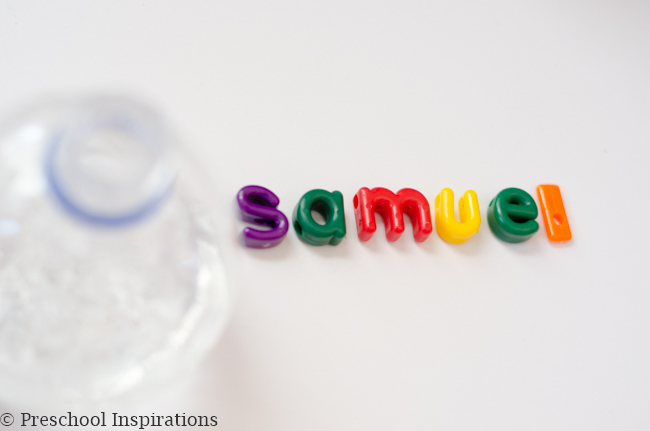 I’ve used them as DIY name stamps, in a sensory tray, for alphabet soup, in discovery bottles, and on and on. This water bottle was from the grocery store, and it originally had flavored water in it. You can find similar bottles at craft stores. I wrote tons more about picking out the perfect bottle to use in my post How to Make a Perfect Sensory Bottle. I usually use skewers with my sensory bottles to place objects in hair gel, but I was completely out. We improvised, and Samuel found me a stick! It was actually super perfect because it had a bend in it, and that was the absolutely perfect utensil for pushing the alphabet beads up against the sensory bottle. Take your clean and empty water bottle and fill it half full of hair gel. Place the alphabet beads in. Samuel helped with this part! After he put all of the letters in, he said, “my name is all scrambled.” So cute! Add more hair gel until your bottle is about 2/3 full. This is very important because otherwise you may have hair gel ooze out otherwise. Ewww. Take your stick/skewer/anything else lying around and push the alphabet beads against the sensory bottle. Arranging them the way you like takes a little bit of time, but it’s still a fairly simple process. You’ll want to get all of the hair gel to mix together, so I just tapped the bottom of the bottle onto the table to make it all come together. The beads sank a bit when that happened, so feel free to put them higher than you would want them to be. Once all of your beads are where you want them, add more hair gel. Keep in mind that this will get dropped, and the beads will shift around and possibly need to be readjusted. I normally glue my sensory bottle lids on, but this one I didn’t because I knew it would need some reorganizing after rolling around the floor a few times. That’s a call you will have to make. I just want to caution you that the alphabet beads are a choking hazard if a child happened to try and get into it. Samuel is old enough that I knew it would be no problem :). 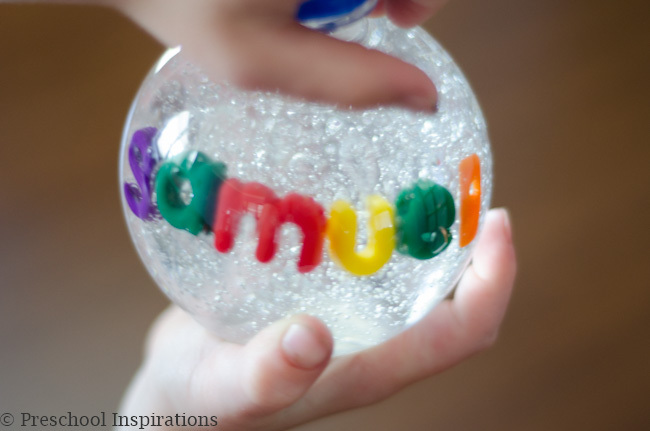 This is perfect to keep on display for children to see their name written out. You’ll see them point out the letters, practice spelling them, and identifying them. Since Samuel was already a pro at recognizing his name, I added the element of having him help spell it out while we made it. I loved hearing about how his name was “scrambled,” and he did a fantastic job helping me out! Need more awesome for ideas for working on names? 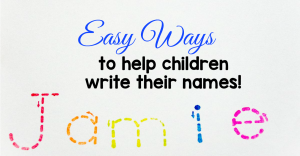 Check out my post on Easy Ways to Help Children Learn Their Names!